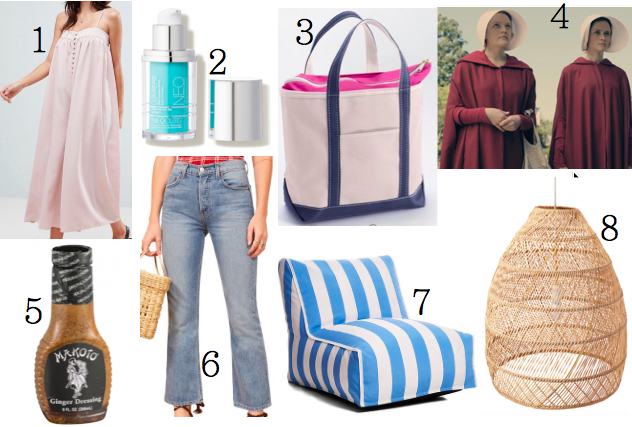 Here are a few of my favorite things right now, but first do not forget the Nordstrom Sale is still on until August 5th! There is still plenty of greatness and they have even restocked a few sold out items I noticed. 1. I cannot believe I just ordered this wide legged jumpsuit. I should have been wearing it all summer long! comes in a romper too. 2. Been getting a lot of questions on eye cream lately. This is the one I use every night. . It is an investment, but you only need a little bit and it WORKS. Even my dermatologist uses it! 3. Everyone loves an LL Bean tote, but did you know you can customize them?! Just figured it out and now I have the perfect bag for tennis/workout gear. 5. You guys, this dressing. I am not kidding has gotten me to eat more vegetables than I thought possible. You can find it in the refrigerated dressing section in Produce (heinen's for you locals) and it changes your life. Great on rice and stir fry too. 6. I am digging a good mom jean, and these Reformation ones are awesome. High Waisted to pull you in, thick denim that will not rip, and a great kick crop to show off your cute shoes at a great price. 7. These cabana chairs come in so many colors and are perfect for porches and patios. Even a kids room! 8. Been eyeing this light for over my island and realized that the Serena & Lily Tent Sale started! So many good finds. Especially bedding, baby, outdoor furniture, and even pajamas.